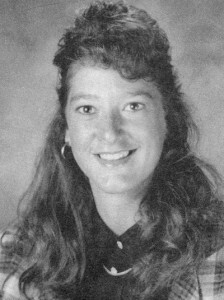 Jennifer S. (Musser) Richards graduated Orrville High School in 1988. She lettered in track all four years and played basketball for three years, earning two letters. In 1986, she was All-Ohio Conference champion in the 100 and 300 meter hurdles and was named Most Valuable Player on the track team. In 1987, she set a conference record in the 100 meter hurdles with 15.6 and another conference record in the 300 meter hurdles at 47.1 and again was named MVP in track. For Richards, 1987 was the best yet when she placed fourth in the 100 meter and first in the 300 meter hurdles in the Regional tournament. This earned her a berth at the State track meet where she placed fifth in the 100 meter hurdles. In 1988, she made All-Ohio in the 100, 300, and 400 meter hurdles and again was named MVP of the team she captained. She placed first in the Regionals in the 100 meter hurdles. Richards went on to win the State championship in the 100 meter hurdles in Columbus. She also set school records of 14.9 in the 100 meter hurdles and 45.34 in the 300 meter hurdles. The track teams she ran on were All-Ohio Conference champions in 1985, 1987, 1988. Earning two letters in basketball, Richards was the captain in her senior year. At the University of Akron she played on both the indoor and outdoor track teams from 1989 to 1993, where she earned three letters. In 1991, she set a school record at U of A of 14.6 in the 100 meter hurdles and was the All-Ohio Sports Festival Champion. She also was national qualifier in the 100 meter hurdles in Division 1-AA. She was also her team captain in her senior year as U of A. She graduated from the University of Akron in 1993 with a Degree in Elementary Education and taught for one year in the Orrville City School system. While there, she coached the seventh and eighth grade girls’ track team to a record of 8-1, winning both the Triway and Orrville Invitational tournaments. Married to Tom Richard of Doylestown for six years, she currently teaches and coaches in the Norton School District.